Now that we have learned how to type Linear B in a document, the only thing left for us to do is to insert logograms and ideograms as required into our text. (b) a combination of two or three syllabograms, one on top of the other, which combine to form the word which they represent. Linear B scribes often resorted to this short-cut in order to save precious space on the tiny tablets they inscribed. The procedure for each of these two different types of logograms is not the same. (1) right after you insert the logogram, you must then select Wrap – Wrap Through, otherwise the logogram will appear above or below the preceding word in Linear B, but not beside. In other words, the logogram must be anchored to the paragraph in which the Linear B word is found, or if there is no paragraph, immediately to the right of the Linear B word. (2) You can easily see that the logogram for “ointment” is actually the Linear B word for ointment. In the sentence, The Queen has wool, the logogram = the syllabogram MA with RE underneath = mare = wool. Note that the logogram is not spelled the same as the word for -wool = mari. For the logogram for honey = meri, see below. The procedure for the insertion of ideograms is identical to method (b) above for logograms such as arepa, mari (above) & meri (below) for ointment, wool & honey respectively. 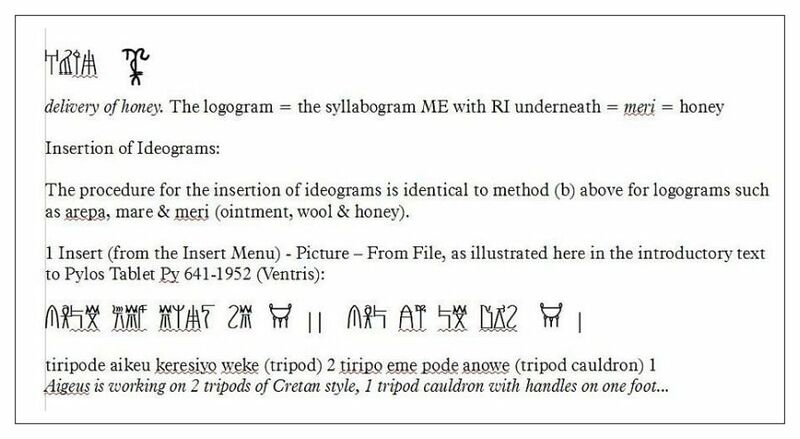 Right after you insert the ideogram, you must then select Wrap – Wrap Through, otherwise the ideogram will appear above or below the preceding word in Linear B, but not beside it. In other words, the ideogram must be anchored to the paragraph in which the Linear B word is found, or if there is no paragraph, immediately to the right of the Linear B word.